Schema markup: how does it work? That’s the 4°episode of the series of webinars that go by the title #SEOisAEO, hosted by Semrush and presented by the super energetic Jason M. Barnard. 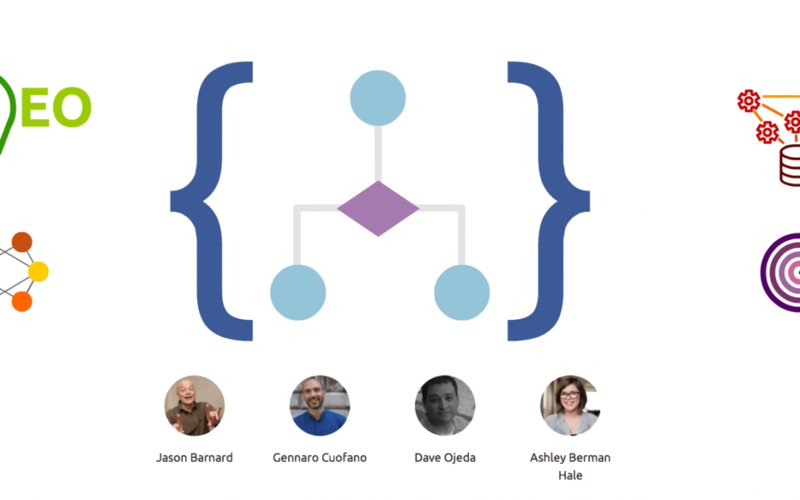 In that one, Jason, who is a Search Engine Marketing Consultant, walks us through everything related to Schema Markup, with the help of his guests: Ashley Berman Hale, Gennaro Cuofano, and Dave Ojeda. In this webinar, Jason and his guests will guide the audience and teach them everything about Schema and how it works. Can we map Schema Markup to Knowledge Graphs? Where types in Schema are entities, properties are attributes, and nested types become relationships? What are some groovy ideas for sameAs for companies, people, and products? If Schema’s feeding action and events, can we just use Schema Markup and not bother creating actions and skills? Voice Schema is good fun to play with. But is that really helpful for business in real life? When designing our site, should we think about the Schema? Does Schema help rankings, directly or indirectly? We are now building the #SEOisAEO position zero profile. In terms of position zero, what does Schema bring to the table? You can find here the complete transcript of the video. It’s rich of examples, tips, and infographics so that you can really dive into the subject and skim it anytime you need.